You use the Plugins manager to dynamically update IJC from the registered update centers and to manage IJC plugins and modules. 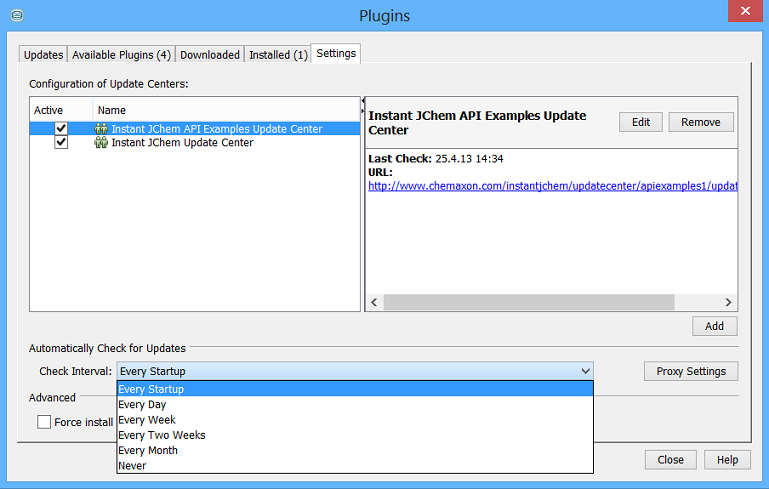 You use the Settings tab of the Plugins manager to view and change settings for the registered update centers and to set how often IJC checks the update centers for updates. You can access this tab by choosing Tools > Plugins from the main menu and clicking the Settings tab in the Plugins manager. Specifies how often IJC checks for updates. Select a frequency from the drop-down list. Click Proxy Settings to set any proxy settings needed to access the update centers. If selected, plugins are installed into directories that are accessible by users other than the current user in a multi-user environment. If unselected (default), the installed plugins are only available to the user who installed the plugin.